Hi, foodies.....Welcome to AYESHA'S KITCHEN. 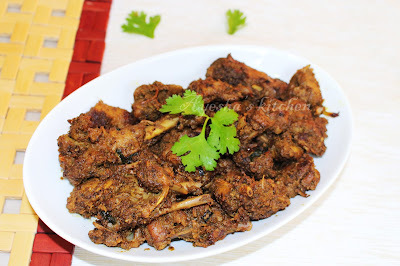 Kerala recipes / Kerala dishes are very famous for its taste and flavor. Kerala roast duck is an authentic and traditional dish of Kerala which is served as a side dish along with Appam, Rice, Steam cake and so on. Roasting a whole duck is almost same as roasting mutton/lamb. 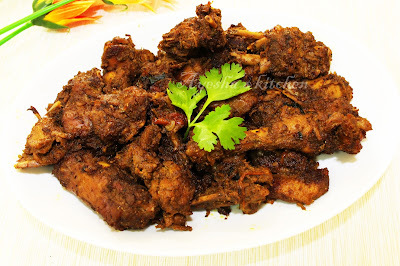 Kuttanadu is a place in Kerala which is very famous for duck roast and known as Kuttanadan tharavu varattiyath . So today let's see how to make that special roast duck which is hot, peppery and finger licking taste. Do try this recipe for roast duck. Heat coconut oil in a pressure cooker and when hot, add sliced onion. Saute for a while and then add green chilies, ginger garlic, and fennel seed. Again saute for few minutes and now add sliced tomato. Mix well and close the lid for a while. Now put the cleaned duck pieces along with turmeric powder, coriander powder, chili powder, garam masala powder, pepper powder(2 tsp ) and salt. When done, off the flame and let it stay for few minutes. Now heat oil in a frying pan and fry few sliced small onions (shallots), some curry leaves, coriander leaves and add then add the cooked duck to it. Cook with the lid open until the gravy becomes thick. Stir occasionally. Finally when done add the remaining pepper powder( 2 tsp) and mix well. Serve hot with ghee rice, appam, puttu etc..